There have been a number of Jester Challenges. The most recent was the Jester Challenge of 2014 for skippers of vessels between 20 and 30 feet, including multihulls. 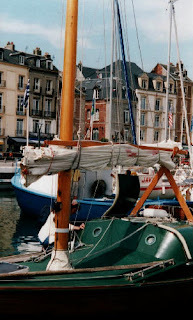 The endeavour or challenge was for participants to sail their yachts single-handed from Plymouth UK to Newport, Rhode Island, USA. The spirit of the challenge was for individuals to test themselves in terms of seamanship and total self-reliance, unlike many of today’s commercially sponsored and highly organized ocean sailing events. There were to be few rules, other than when to start, where to start and where to go. The gathering together of sailors was to be on a ‘gentlemanly’ basis, which suggests to me that it was done in the spirit of friendship and comradeship, not competition. The inspiration for these sailing challenges can be traced back to the 1960 Single-handed trans-Atlantic Race when Lt Colonel H. G. Hasler invited Val Howell to take part with his Scandinavian Folkboat, ‘Eira’. 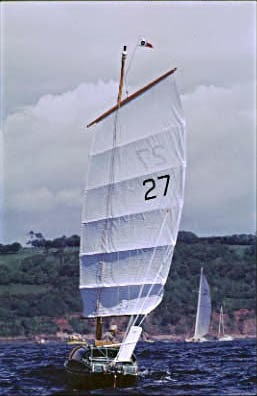 Hasler had modified a similar Folkboat named ‘Jester’. He completely decked her in and re-rigged her with a single Chinese lugsail. This unique setup provided protection for him from the elements. He was able to work the boat from within her cabin where all control lines were to hand. Additionally he had the aid of a wind-vane steering system that he designed and built himself. Francis Chichester famously won the race in a much bigger yacht, ‘Gipsy Moth 111’. Another of the Jester challenges was the Azores Challenge of 2008, a shorter ocean passage from Plymouth to Tierciera Island in the Azores Archipelago. The upcoming event, the Jester Baltimore Challenge 2015, will be for less experienced sailors who will be able to try their hand alongside some of the veterans of previous challenges. The spirit of the event will be as before. There will be two starting venues: Plymouth, and Pwllheli, the aim being for participants to sail solo the 250 nautical miles from either venue to Baltimore in the Republic of Ireland. This will be a wonderful opportunity for anyone wanting to give it go, perhaps to gain confidence for going further afield and to find out if long-distance sailing is for them. They will also have a chance to meet more experience ocean sailors. I shall be following the Hurley 22's...! 24' pro, 25 cat, a number of 25/28' trimarans and others including Colin Angus in a modified RowCruiser with outriggers and yawl rig. I thought you would be leading them! Many thanks for the link to Race Alaska - what an amazing line up! It's obvious that several participants are doing the race not to win, but as a challenge for themselves with the aim of completing the 750 mile course no matter what it takes. I'll be interested to see if the stand-up paddle-boarder makes it to the finish line.